Mayla is one of the most striking hardy water lily available. The color of this hardy water lily flower sets it apart from almost any other hardy lily. Fully mature specimens have bright fuchsia-pink blooms and are set off by a mass of very long, bright-orange stamens. Shocking, brilliant deep fushsia flowers about 6” across that stand slightly above the water. Hybridized by Dr. Kirk Strawn in 1993. Fuchsia pink throughout petals. Flower shape Stellate, then wide open. Flower size 5-6 in. Strong fragrance. Top medium green, some leaves are plum colored, newer leaves deep plum, underside, reddish purple. odorata rhizome, very free flowering. One of Kirk Strawn’s favorite (and finest) hybrids, the vivid fuchsia flowers of this lily are large and open wide to “show off” long, orange stamens and rest gracefully on the water’s surface. The flowers are exceptionally fragrant as well. This one is a showpiece for any size pond. Medium to large waterlilies can be placed in the pond at approximately 18-30 inches deep. The smaller varieties can be 8-12 inches deep and dwarf waterlilies at about 6 inches deep. The larger waterlilies will grow in shallow water, although they may not flower as much as if they were in deeper water. A leader in Pond Supplies – A Leading Supplier and Grower of Pond Plants for Your pond! 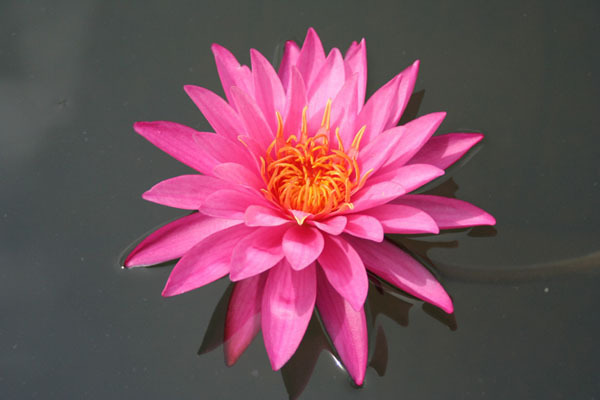 Pond Supplies / Pond Plants / Pink Hardy Water Lilies – serving Los Angeles for over 25 years! 2 Responses to "Pink Hardy Water Lily – Mayla"
I am interested to buy few water lily plants. I could not find the price at your website. Please give me an idea about pricing eg. for Mayala, White lemon Yellow etc. Description of plants size / flower this year ? / flower size / Leaf sizw etc.